Surely you can break your system password using command prompt only. 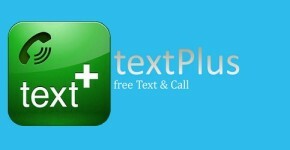 There is no need of any other software and no necessity of an internet connection. 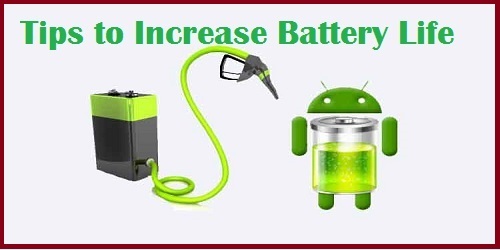 At the time of doing password breaking, you have to follow steps same as in this article. 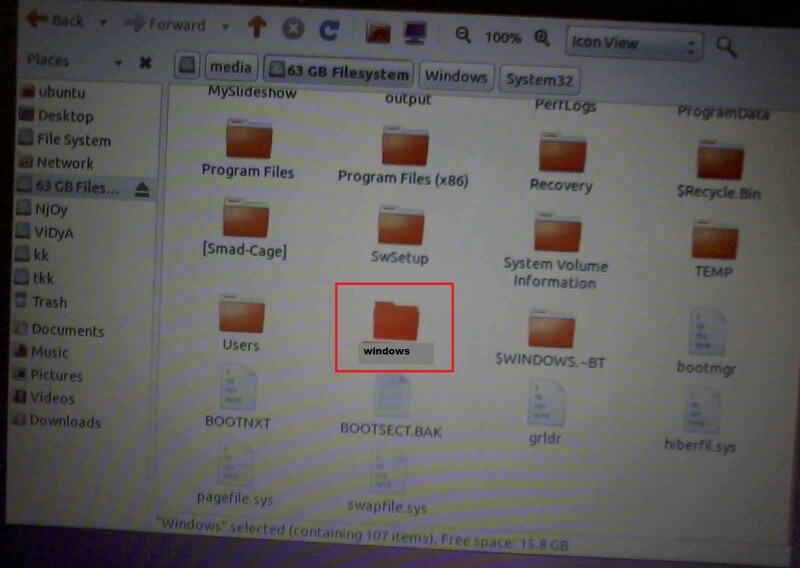 And also you need anynon-windows OS setup files like, Ubuntu, Linux Mint, and Fedora etc. Copy those non windows OS setup files on your pen drive, other than this setup files, your pen drive shouldn’t have nothing. 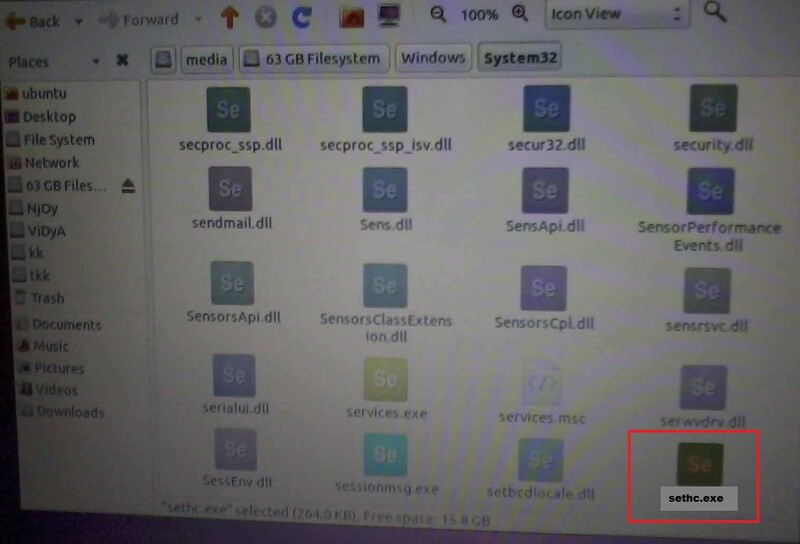 If you have proper setup files no problem, if you have .ISO file, it is better to extract using Universal USB installer. Universal USB installer is a free software, we can use it for making bootable pendrive/DVD. It takes very little time for creating bootable pendrive/DVD. 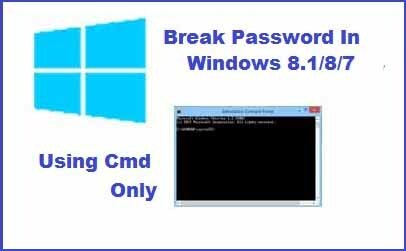 Using command prompt only we can reset/ break password on windows 8.1/8/7. You can see all the steps with images and with description. 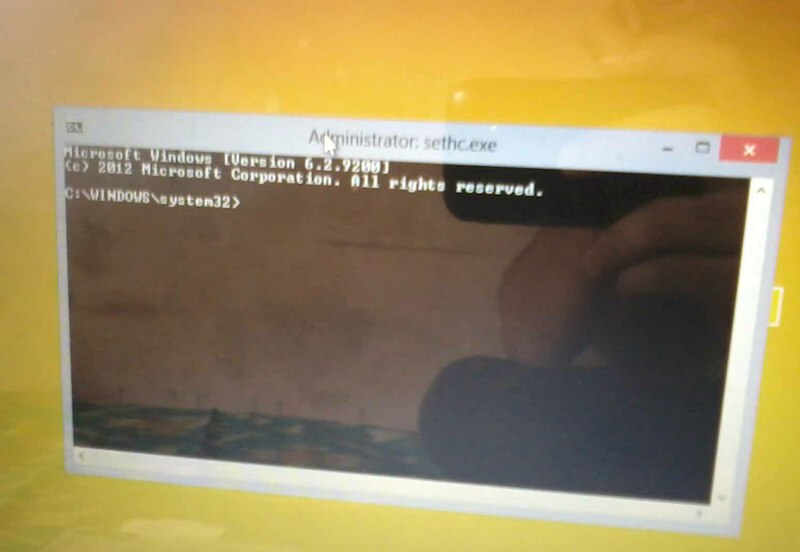 I have used Ubuntu operating system for workout the problem of breaking/reset password on windows 8.1/8/7. 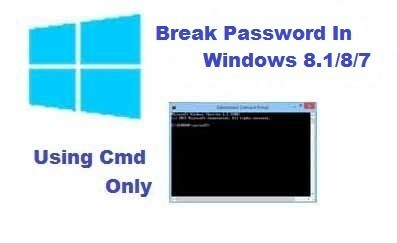 Follow below uncomplicated steps for breaking password to your windows PC/Laptop. STEP 1: In the starting step we have to take the pendrive which has copied Ubuntu setup files. I am using Ubuntu setup files for breaking windows system/laptop forgotten password. 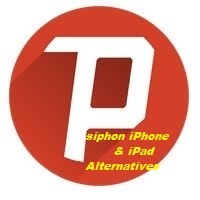 What are the software’s available, you can use them except non windows like windows 7/8/8.1. Restart your system and insert that Ubuntu bootable pendrive into your forgotten windows system/machine. 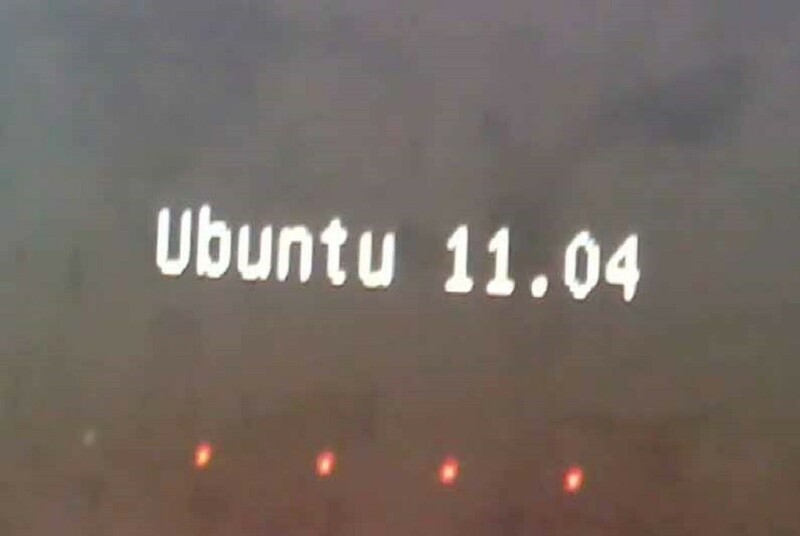 After inserting of that pendrive, you will see a window, then after you have to continue with “Try Ubuntu without installing”. 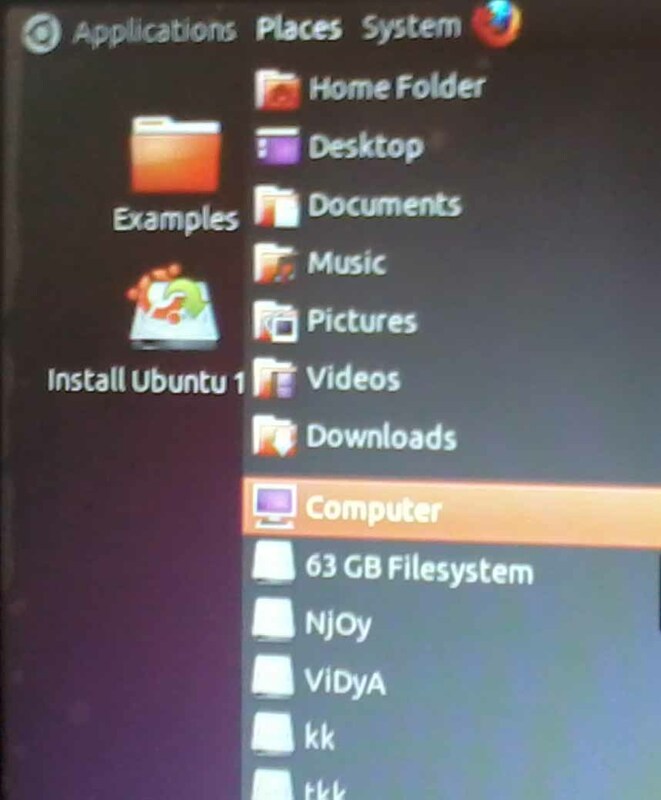 No need to install the Ubuntu OS on your windows system. See image for this step below. STEP 2: If you press ENTER KEY on Try Ubuntu without installing, next you cansee Ubuntu software will be loading. See below Image. STEP 3: In this step you can see same as like given image on your system. Open “Computer” and go further steps. STEP 4: In this step you have to select “C DRIVE” and open the folder with the name of “Windows”. 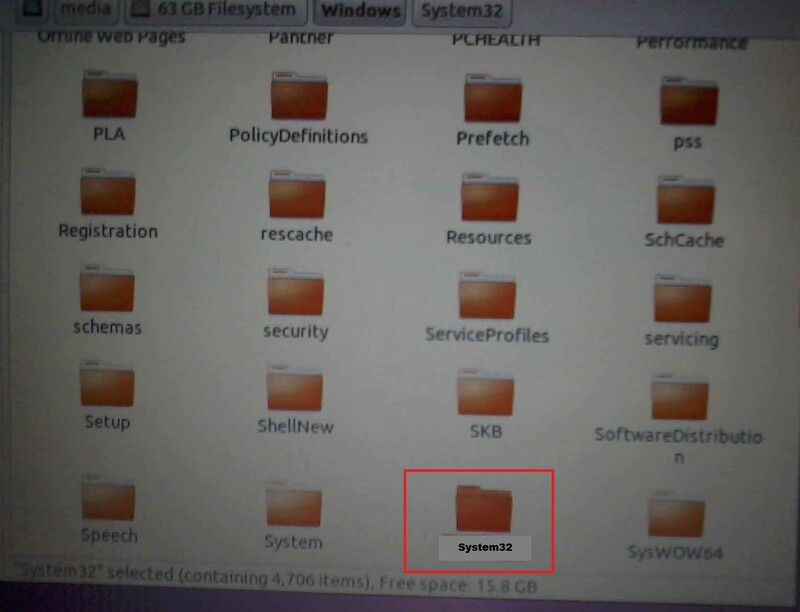 STEP 5: If you opened that windows folder, you would see “system32” folder in it. 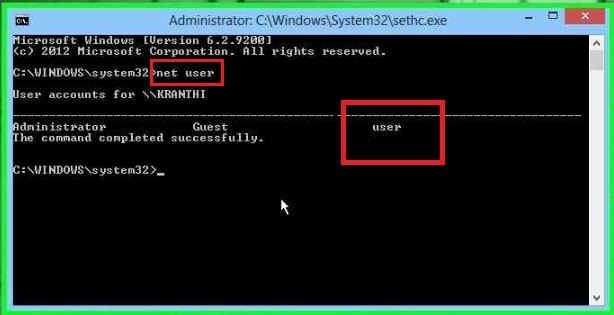 STEP 6: Here you have to open system32 folder, then you will see”sethc.exe” file. 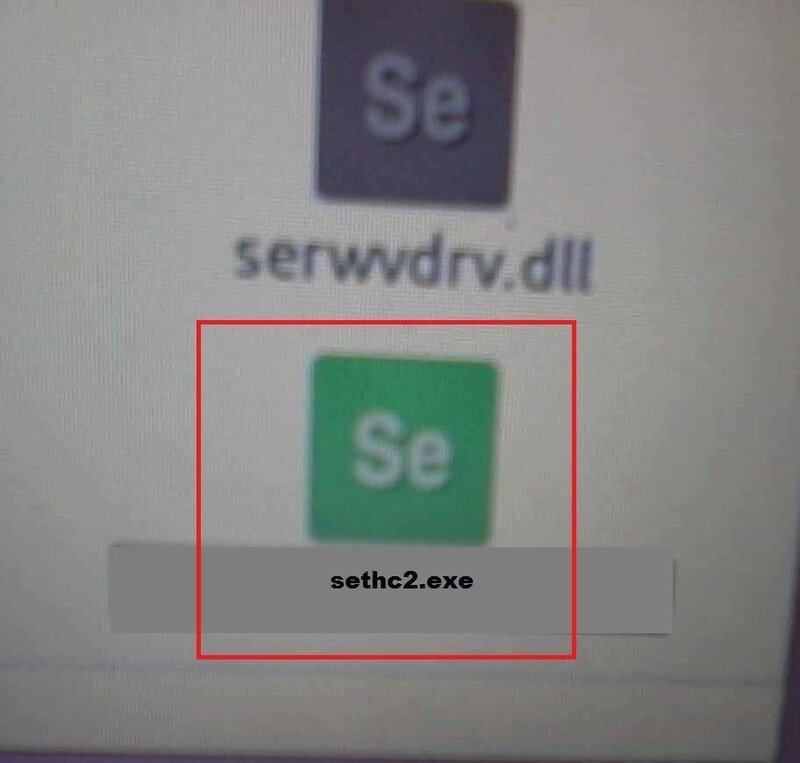 STEP 7: This step is very important, here you have to rename the sethc.exe file, means do not wipe that sethc.exe completely, just add some name or letter or character to sethc.exe file. STEP 8: You can find the “cmd” file in system32 folder. You have to do rename to cmd file. 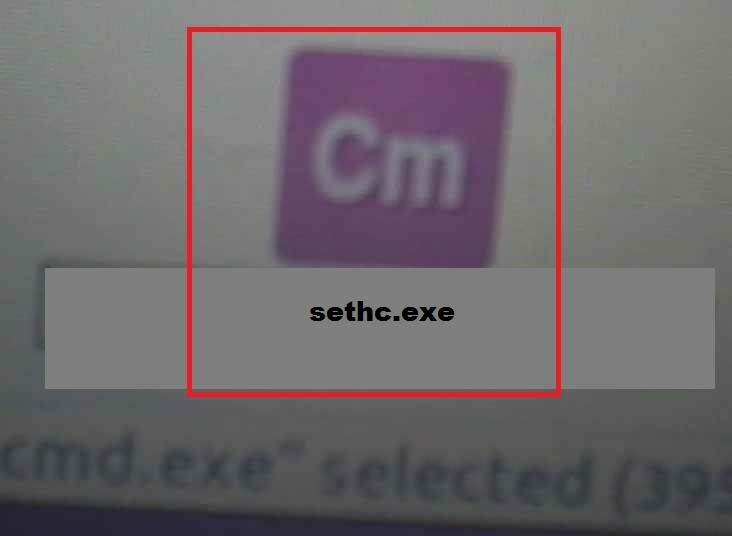 Rename cmd as sethc.exe.See below given image for that. STEP 9: If above all steps has done, now you can shutdown your system and remove pendrive from system. You must do: After shutdown has done to your system, then click on power button of your system, there have to press SHIFT KEY as continuously 5 times. Then you will see a window having with command prompt. 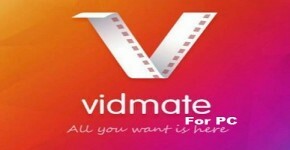 Look at below image. STEP 10: In this step you have to type your system username in command prompt. If you forgot your system username, you would get that username in cmd by just typing “net user”. My system username is user. See below image for confirmation. 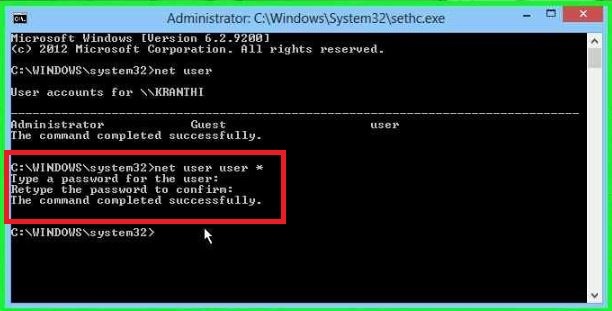 STEP 11: Like in the below given image you have type carefully that command in your command prompt. Command you need to type in cmd like, net user [in this bracket you have to write your system username]*and hit enter. 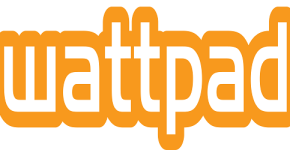 NOTE: Do not keep brackets to either side of your username, just type username. Follow like in the below given image. STEP 12: In this step you will asked to type a new password to your system, type memorable and easy password and again hit the enter key. STEP 13: Again it will ask you to retype the password. STEP 14: Finally you can see in the cmd like “The command completed successfully”. 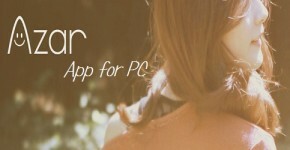 Now you can enter the password and open your system. 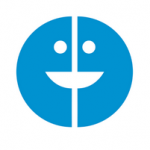 You should keep inverted commas(“”) either side of your username, when your username has separated with space. 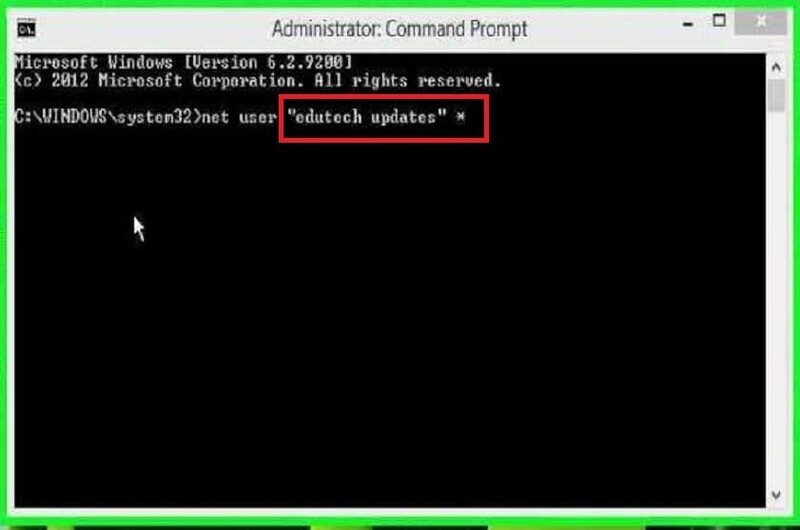 You must do: Ex: If your system username separated with space like (edutech updates), you should write this space separated username in between inverted commas(“”). 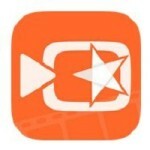 You can see image for this. Friends what I have written above content is not that much of complicate as you thought, just do practically and observe how simple it is. 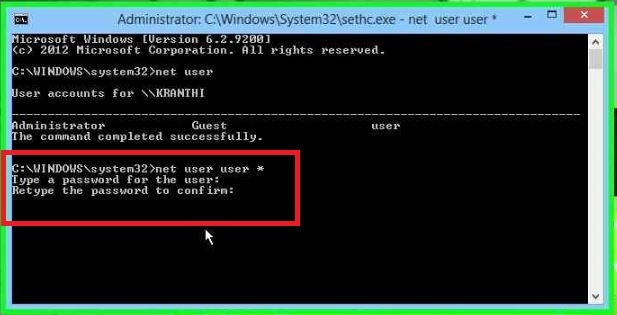 If you find any mistakes about How to Break/Reset Password on Windows 8.1/8/7 Using Command Prompt article you can send them in comment and share on social media.